Sofia is a small bench top analyzer that uses advanced fluorescence detection with an ultraviolet LED energy source. The optical sensor inside of Sofia scans and collects hundreds of data points on the test strip contained inside of a Sofia FIA test Cassette. Sofia uses proprietary algorithms to analyze the data, interpret the signals and determine the results. All automatically to give you an objective result you can rely on. Sofia offers an easy-to-use interface, customizable settings, flexible work flow options, bar code technology and LIS connectivity. Results are reported automatically on the screen and can be stored in Sofia, on the SD Card provided in the install pack, printed using the integrated printer, or sent to the LIS. Sofia has two modes that can be used depending on your workflow requirements. Sofia WALK AWAY mode may be most convenient for reading a single patient sample. You can walk away during the development period. In this mode, the patient sample is dispensed into the Cassette and the Cassette is immediately placed in Sofia. Sofia will automatically develop the Cassette for the required time period (pre-programmed for each test), scan the Cassette, and display the test result. 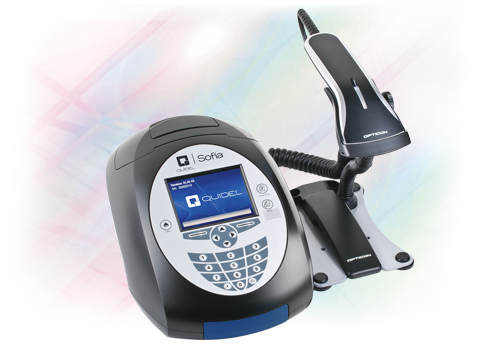 Sofia READ NOW mode may be most convenient for reading several patient samples. In this mode, the patient sample is dispensed into the Cassette. The user then manually times the development period outside of Sofia. This can be done on the counter or bench top using a timer. * Once the development time is complete, the Cassette is placed in Sofia where it is immediately scanned and the test result is displayed within one (1) minute. *Refer to the assay-specific Package Insert for the required development time.